Despite the NoSQL hype, traditional relational databases are not going away any time soon. In fact, based on continued market evolution and development, SQL is very much alive and doing well. I won’t debate the technical merits of SQL vs. NoSQL here, even if I were qualified to do so. Both approaches have their supporters, and both types of technologies can be used to build scalable applications. The simple fact is that a lot of people are still choosing to use MySQL, PostgreSQL, SQL Server and even Oracle to build their SaaS/Web/Social Media applications. 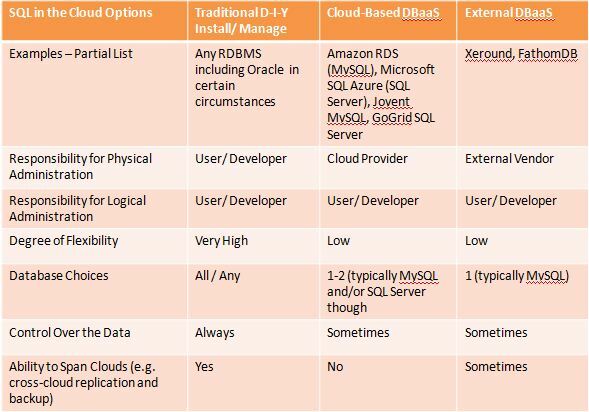 When choosing a SQL option for your cloud-based solution, there are typically three approaches as outlined below. One note – this analysis applies to “mass market clouds” and not the enterprise clouds from folks like AT&T, Savvis, Unisys and others. At that level you often can get standard enterprise databases as a managed service. Install and Manage – in this “traditional” model the developer or sysadmin selects their DBMS, creates instances in their cloud, installs it, and is then responsible for all administration tasks (backups, clustering, snapshots, tuning, and recovering from a disaster. Evidence suggests that this is still the leading model, though that could soon change. This model provides the highest level of control and flexibility, but often puts a significant burden on developers who must (typically unwillingly) become DBAs with little training or experience. Use a Cloud-Managed DBaaS Instance – in this model the cloud provider offers a DBMS service that developers just use. All physical administration tasks (backup, recovery, log management, etc.) are performed by the cloud provider and the developer just needs to worry about structural tuning issues (indices, tables, query optimization, etc). Generally your choice of database is MySQL, MySQL, and MySQL – though a small number of clouds provide SQL Server support. Amazon RDS and SQL Azure are the two best known in this category. Use an External Cloud-Agnostic DBaaS Solution – this is very much like the cloud-based DBaaS, but has a value of cloud-independence – at least in theory. In the long run you might expect to be able to use an independent DBaaS to provide multi-cloud availability and continuous operations in the event of a cloud failure. FathomDB and Xeround are two such options. In my discussions with most of the RDBMSaaS solutions I have found that user acceptance and adoption is very high. When I spoke with Joyent a couple of months ago I was told that “nearly all” of their customers who spend over $500/month with them use their DBaaS solution. And while Amazon won’t give out such specifics, I have heard from them (both corporate and field people) that adoption is “very robust and growing.” The exception was FathomDB was launched at DEMO2010. They seem to not have gained much traction, but I don’t get the sense they are being very aggressive. When I spoke with one of their founders I learned they were working on a whol new underlying DBMS engine that would not even be compatible with MySQL. In any event, they have only a few hundred databases at this point. Xeround is still in private beta. The initial DBaaS value proposition of reducing the effort and cost of administration is worth something, but in some cases it might be seen to be a nice-to-have vs. a need-to-have. Inevitably, the DBaaS solutions on the market will need to go beyond this to performance, scaling and other capabilities that will be very compelling for sites that are experiencing (or expect to experience) high volumes. Amazon RDS, for instance, just added the ability to provision read replicas for applications with a high read/write ratio. Joyent has had something similar to this since last year when they integrated Zeus Traffic Manager to automatically detect and route query strings to read replicas (your application doesn’t need to change for this to work). Xeround has created an entirely new scale-out option with an interesting approach that alleviates much of the trade-offs of the CAP Theorem. And ScaleBase is soon launching a “database load balancer” that automatically partitions and scales your database on top of any SQL database (at least eventually – MySQL will be first, of course but plans include PostgreSQL, SQL Server and possibly even Oracle). My friends at Akiban are also innovating in the MySQL performance space for cloud/SaaS applications. Bottom line, SQL-based DBaaS solutions are starting to address many (though not all) of the leading reasons why developers are flocking to NoSQL solutions. Cloud-based DBaaS options will continue to grow in importance and will eventually become the dominant model. Cloud vendors will have to invest in solutions that enable horizontal scaling and self-healing architectures to address the needs of their bigger customers. While most clouds today do not offer an RDS-equivalent, my conversations with cloud providers suggest that may soon change. Cloud-Independent DBaaS options will grow but will be a niche as most users will opt for the default database provided by their cloud provider. The D-I-Y model of installing/managing your own database will eventually also become a niche market where very high scaling, specialized functionality or absolute control are the requirements. For the vast majority of applications, RDBMSaaS solutions will be both easier to use and easier to scale than traditional install/manage solutions. At some point in the future I intend to dive more into the different RDBMSaaS solutions and compare them at a feature/function level. If I’ve missed any – let me know (I’ll update this post too). What about SQL Azure adoption? Could add one to your list as, “Generally your choice of database is MySQL, MySQL, and MySQL u2013 though a small number of clouds provide SQL Server support.” nnThis one uses PostgreSQL 9.0.3: http://younicycle.com.